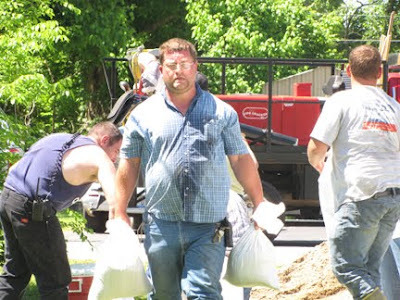 Magistrate Candidate Travis Sosh coordinated the sandbag effort at Dycusburg last week to prevent the Dycusburg Baptist Church and fellowship hall from flooding. Pictured here is Travis hard at work (courtesy of The Crittenden Press). Brenda Underdown shared this photo with Larry Bragdon who e-mailed it to share on this site. 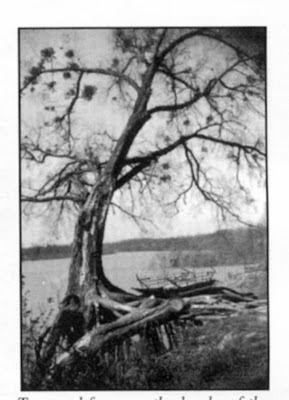 It is from the Crittenden County Pictorical History Book. Brenda wrote: "Marian Hina Stuart submitted the picture when we did the book. She lived somewhere in Tennessee then. She was from the Hina family that lived at Lafayette Heights during the Lafayette Mines era." Behind the tree is the Dycusburg ferry. Year unknown. 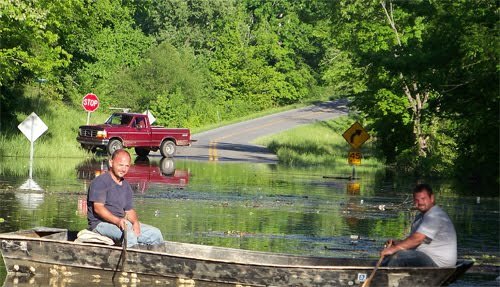 Jerry Marshall (L) and Danny Sharp await their next passenger on a flooded section of KY 295/Dycusburg Road just south of the Dycusburg community in southern Crittenden County. Cumberland River floodwaters have turned an area along the Crittenden-Lyon County line into an island. The two ways in and out are covered by water. Marshall and Sharp are using a Jon boat to help their neighbors get in and out to go to and from work.